Availability: Free Shipping in the US - Destiny Rooted arrives in about a week. Destiny Rooted by Tony of Beverly has graceful long layers with flared edges of light layering throughout the sides and back, and feathered bangs. Destiny Rooted is made with EluraBlend Fiber, an exclusive proprietary blend of Kanekalon modacrylic fibers. Tony of Beverly Destiny wigs in rooted colors feature a light weight, durable open cap HarpCap construction. 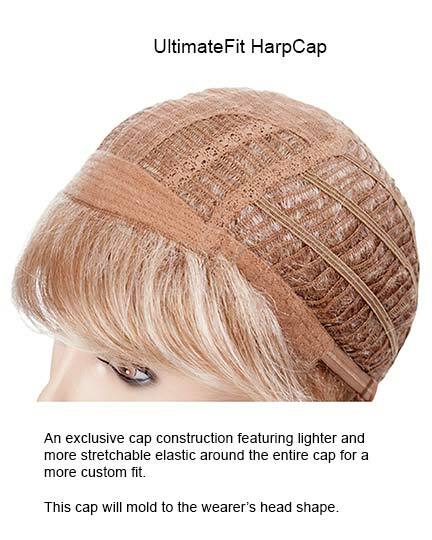 When lighter, airy styles such as Destiny Rooted are desired, this exclusive cap design is used. Note that the wefting is attached to a smaller contoured lace material at the crown. Destiny is shown in the regular color, 24BT18. We do not have an image of Destiny in a rooted color. The Destiny Rooted wig weighs 146 grams. There are 4 colors available for Destiny Rooted. If you would like to discover other products that share some of Destiny Rooted's qualities try the links below.